If you are a blogger then you probably understand the importance of ranking high in Google search. Google is the giant search engine and you do not want to lose your Google search ranking or do something that will invite Google to punish your blogs. No matter you are a newbie or established blogger, when it comes to be professional there are things that every single blogger should take care of. When working on a blog, it is really necessary to work according to the search engine rules or I can say work according to Google policies. You may have heard about Google updates that Google runs every year to analyze the quality of blogs to make the high quality content rank higher and low quality content fall in doom. Do you want to lose your Google search ranking? That means you should read this article carefully to understand what are the mistakes that invite Google to punish your blog? Google can remove your content from Google search results or in worse cases ban your site from Google search. Let`s see what are the mistakes that you are making which can cause a Google penalty on your blog. If you are a newbie then you may not aware about that duplicate content can not only cause you DMCA penalty but also make the Google hit your site really hard. Duplicate content is an invitation to Google to punish your blog content. If you are running a blog on Blogger, then Google may completely remove your blog from their platform and you can do nothing about it or it can simply downgrade your search ranking. If you have blog on self hosted platform such as WordPress, then you may not lose the blog, but you still get penalized on your Google search ranking. Remember: No content is much better than duplicate content. If you do not know that your blog has duplicate content or not, then you can check it on copy content checker tools. Are you thinking that by adding the main keyword multiple times will help you rank higher in Google search? If yes, then I must say “OMG”. But, keyword stuffing is the big reason why most of the sites get penalized by Google algorithms. There is no doubt that keyword helps you to attract target reader. But, when you overdo it, you are just inviting Google bots to find out about your evil skills and beat your blog down to the end of the list. Tip: If you want to use the keyword multiple times in your blog, then first increase the word count and also use LSI keywords to make things natural. You can use keyword density checker tools to analyze the keyword density on your article. Now you may ask what is the poor or spammy backlink profile? In simple words, if you are getting tons of backlinks from poor quality or think resources then you are making a big mistake which will lead your blog to a Google penalty. If you are doing such things that mean, you are showing the true color of your backlink strategy to Google. Once Google will find out, it will make you cry for your mistakes. I am not saying that you should not comment on blog. Actually you should, but spam commenting tells your story. Remember: When commenting on a blog always think about adding value, not just about backlinks. Also manage the dofollow and nofollow ratio of your backlinks. There are people who think that only paid links invite penalty. Let me tell you that any kind of link which is spammy or of no value is enough to invite Google to punish your blog or website. Here I have: Free Best Online Backlink Checker Tools for you to check your backlink profile. Use Google disavow tool for spammy backlinks. Focus on getting links from high quality sites. 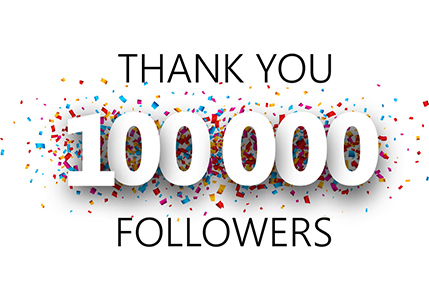 Only buy backlinks from high quality sites with permanent nature. If your blog or site is hacked or you have some kind of malicious code on your blog then you will easily fall in the hands of Google algorithm updates. It is your job to keep your website secure. If you are not sure that your site has some malicious code or not, then you can check it on Sucuri SiteCheck. It is a Free Website Malware Scanner. Do you think that using the same anchor text everywhere will help to improve your search engine ranking? If yes then I say “NO”. If you are doing so, that means you are telling Google that you are in black hat SEO and it should punish you. For God`s sake stop doing it. Be genuine and only used the anchor tag which is necessary. You can use LSI keywords in anchor tags to link the same article multiple times. I know you want to make money blogging, but do you think that adding too many ads make the user click on them. If you are using too many ads, that means you are actually forcing the ads on the reader. Only show relevant ads or use Google Adsense Heatmap to plan where you should show ads. Though Google has removed the limit of showing ads per page, still the best practice is to show 3 ads on a page. You can also use affiliate marketing to boost your earning. How do you find out that your readers are interested in what you are writing or not? The easiest way is to look at your bounce rate. High bounce rate means that readers close your blog too early as they do not find the content relevant or they are fed up watching the same thing everywhere. High bounce rate tells that you need to work hard to please your readers. If you cannot make your readers happy then how can you make Google happy? Google is all about quality and value. If you are not delivering it that means Google don`t want you to be on first place. I always say that focus more on your readers than SEO. Bring quality and uniqueness to your content. If I visit your site or blog and see that I can’t navigate easily or the website is too slow, do you think I will ever visit your site again. 90% times I will not. Because I don`t have time to waste looking at highly unmanaged site. That means you are giving me bad user experience. When I say bad user experience that means at any point of time Google is going to knock the door down and hit your blog harder. Save your blog from disaster. Optimized your site not just for SEO, but also optimize design, make it responsive and improve site speed. 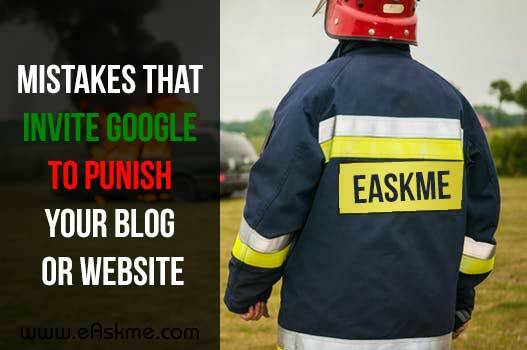 Now you know, what are the 8 mistakes that invite Google to punish your blog? Also remember: Don’t be afraid of Google algorithms. Google is your friend. Just don`t cheat him and add value to user. Do you have any question; feel free to ask me via comments. What do you know about Google algorithms? Has your site ever penalized by Google? How you have fixed that? Also don`t forget to like us on Facebook and subscribe eAskme newsletter to stay tuned with us. If you like what you find here, don`t forget to share it with your friends and family on Facebook twitter and Google Plus.